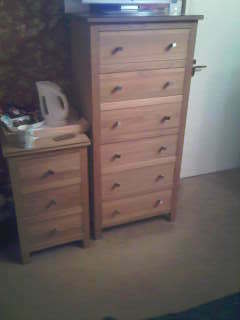 The troublesome chest of drawers - the larger of the two sets. Well, during August 2008, me and my (now ex) girlfriend spent a weekend in Barmouth in Wales at a hotel called Tal-y-don. Or something similar. Which was a bed & breakfast and a pub all rolled into one. On the Sunday night we had a few drinks in the bar before calling it a night. At some point during the night we both woke up for a few seconds after hearing an enormous bang noise. I assumed it was some drunkard outside and we were both sound asleep within a minute or two. When I woke up in the morning, I was pretty shocked to see a drawer lying at the foot of the bed, a good distance away from the chest of drawers. The drawer was the third one up from the bottom, a couple of feet off the ground, which would explain the loud bang. I was also freaked out slightly due to the fact the bathroom door was wide open and I distinctly remember closing it the night before.